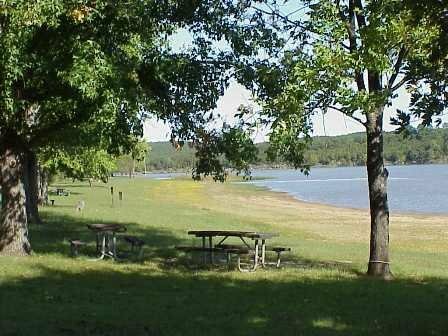 Sheppard Point Campground, operated by the U.S. Army Corps of Engineers, offers camping in Oklahoma's Sandstone Hills on Heyburn Lake. 21 RV campsites with 30-amp electric hookups, including one handicap-accessible site, are available, as well as 17 non-electric tent campsites. A few of the sites feature tether poles for equestrian camping and direct access to trails. Two large group shelters, one that is handicap-accessible with 15-amp electric hookups and one without electricity, are offered at the campgrounds. Recreation is made easier at Sheppard Point Campground with a playground, swim beach and boat ramp. Other amenities in the campground include drinking water, flush toilets, showers and a dump station. Located on the north side of Heyburn Lake.